Cocksure flair’s a big part of The Drums’ appeal, but historically their gigs’ve been real head-scratchers. The original lineup’s instrumental chops were basic to the point of paint-by-numbers record replication, and leader Jonny Pierce’s ongoing throat issues forced one of rock’s weirder Plan B’s: a lower register croon not that far removed from Bill Murray’s infamous SNL lounge douche. If you weren’t clued-in to band history you might’ve wondered if you’d been punk’d. 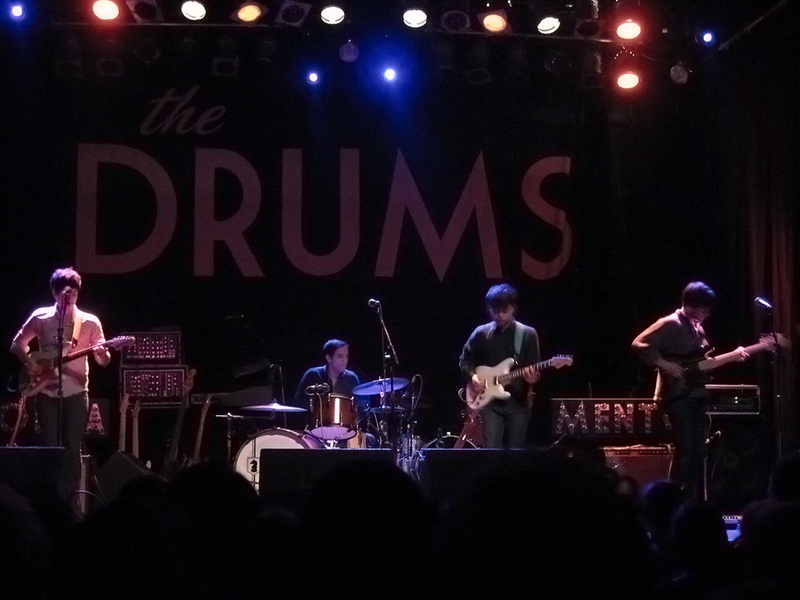 So, the big news in the state of The Drums c. spring 2012 is they’ve morphed into an awfully good live combo. New ballgame. The grandiose-yet-ramshackle studio versions might win your head, but the fleshier live versions’ll take your heart and feet. Ask the swaying throng who grooved to last Friday’s Toronto set at The Phoenix (April 27). 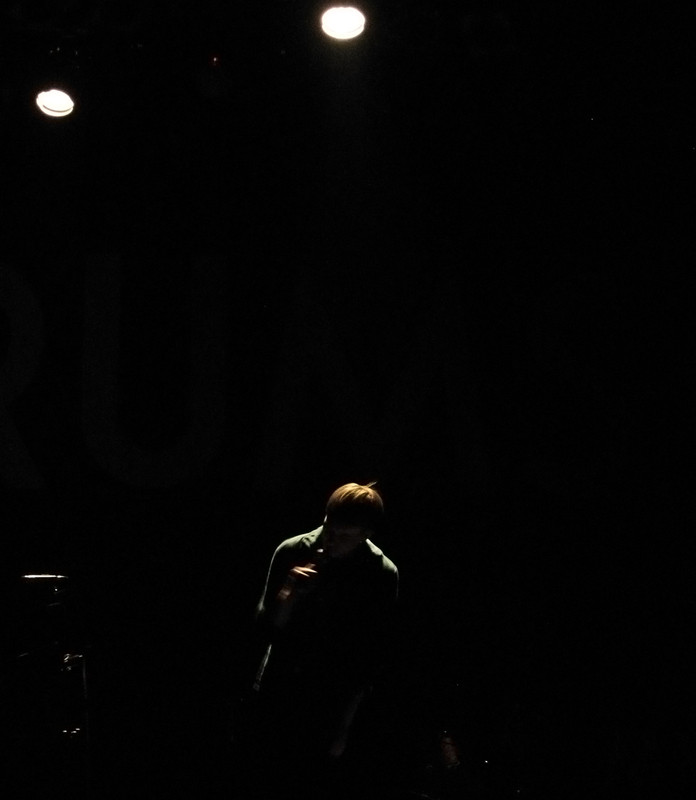 The Drums deal in pulse-racing post-punk with melodic spangles and dramatic peaks. Now that they can play them too they may as well start wearing capes and tights. Not to get persnickety about it, but The Drums have made the jump in part because Pierce and running mate Jacob Graham have filled the batting order with better players who’ve never contributed to those spindly recordings. Connor Hanwick’s touring Japan with g-f Peggy Wang’s The Pains of Being Pure At Heart and I dunno where his head’s at, Drums-wise. The current team, which includes Myles Matheny of Violens, is accomplished and fluid. I really like Matheny here, switching between guitar and bass, providing clever and crucial backing vocals. Given how essential vocal stacking is to Pierce’s songs, a strong second singer with falsetto range is spun gold. My issue with present-day male indie singers is mumbled lyrics low in the mix. 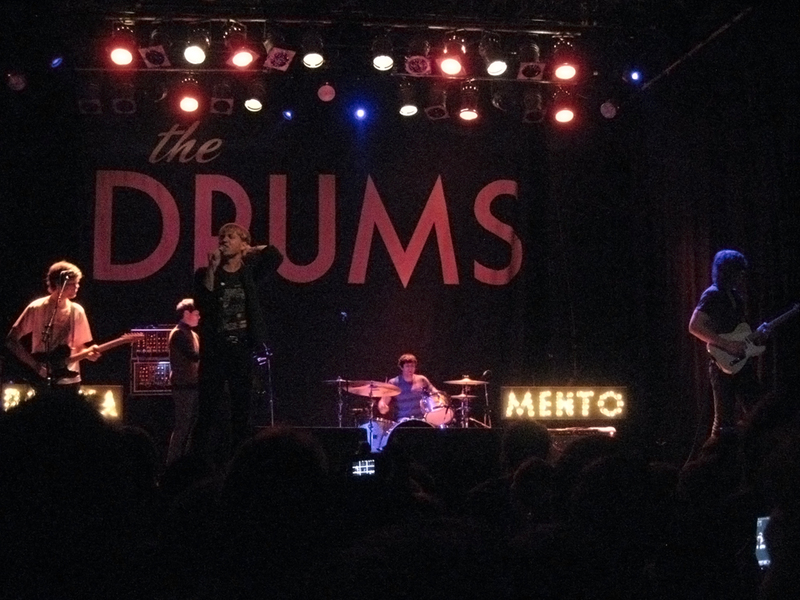 With Matheny’s support, Pierce’s emergence as a quality stage singer is a major step forward for The Drums. That hammy croon, which worked brilliantly exactly once but vexed me every other time, is nowhere to be heard. Slow tunes (“The Future,” “Down By The Water”) and spiky singles (the brilliant, frantic “Money,” “Me And The Moon”) alike soared without the fretful spectre of an indie kid absorbing a beatdown from his own song arrangements at every corner. This iteration’s sculpted professionalism afforded all sorts of winning moments, often in powerful codas (dark tension in “If He Likes It Let Him Do It,” propulsive thrust in “Days,” encore-quality incandescence in “Me And The Moon”), but also in picking up the relative slack in the good-but-not-great Portamento’s song stock. The Drums might one day match the debut LP’s wondrous first side, but while we’re waiting on that it’s encouraging to hear the newer tunes taken to their aesthetic best-possible extreme. The result, spread across 62 minutes and 15 songs (seven drawn from The Drums, eight from ‘Mento) left the crowd thoroughly satisfied and uncharacteristically loud, at least for an indie club crowd ‘round these parts. We even had a crowd surfer at one point. A more typical Toronto reserve blanketed Craft Spells’ earlier set. Idle Labor is a really nice record – #9 on my 2011 year-end – and the San Fran band’s Factory/Magnetic Fields dream pop is an ideal match for a Drums audience, but the vibe felt like a blind date, both artist and fan holding back a little, despite Spells playing Toronto twice before. Spells’ half-dozen Labor songs stuck to the recorded blueprint, which probably provides a pretty good reference point for the three tunes from the imminent Gallery EP. It appears these’ll be more rhythmically assertive, with pounding toms to the fore. Singer Justin Vallesteros still affects a fine Ian Curtis-lite baritone but I hope he’s raised the level on his vocs a couple tics. (He’s one of those guys, see.) Anyway, established blog faves like “After The Moment” and “You Should Open The Door” sparked recognition from the crowd, and seemed to help shift a few units at the merch table at night’s end. Last year, in the wake of rifts, defections and a glum second album I wondered whether The Drums were long for this world. And it mightn’t’ve bothered me if they’d gone kaput. Now it would. I’m not sure who’s temping and who’s permanent, but this is certainly the right time to catch The Drums in concert. September’s shopping bag: a lot of quality cats with previous year-end top 10 albums weigh in. Some months you’re happy to have functioning ears. A record written, recorded and released during the dissolution of a marriage, a tricky proposition when the principal band members are the couple in question, which understandably informs and even cripples the heretofore sweeter and fresher Rosebuds. In the words of the opening song, “diluted and faded, still safely there.” Aside from the choppy, seething “Woods,” it’s all pretty morose, rather pretty but stolid, as though Ivan and Kelly are going out of their way to be polite in front of the in-laws. What they’ve committed to tape’s admirably convivial. Kelly’s dreamy “Come Visit Me” suggests there’s desperate paddling beneath the calm surface: “I want to feel something way out here/I need something to happen now, even if it fucks me up” is pretty direct for this duo. Less bald but just as sad, “Limitless Arms” is shiveringly gorgeous, maybe the best song of Rosebuds’ distinguished career. Ivan hasn’t much to say after a perfunctory verse, cooing “I feel like I’m reaching out for the last time” for the better part of three minutes. In this setting, it’s poetry. Loud Planes Fly Low is too withdrawn to match their best, but no matter The Rosebuds’ future, they’ve left us this song for all our break-up playlists. Spindly indie of occasionally great beauty and pop attack. Considering the singer’s capacity to annoy, were his lyrics more incisive and the guitar work more flamboyantly creative, The Drums would be closer to The Smiths than you thought possible. But they’re a bit of a mess right now – one of the guitarists quit and everyone else has flipped instruments. The shifts’ve taken a toll on Portamento. On a case-by-case basis the songs are fine, but there’s a shortage of the explosive dynamics that characterized the debut. The result – smaller, more pessimistic, radio unfriendly – is the kind of record that landed a lot of second-division indie bands in label hot water 30 years ago (Comsat Angels and The Sound come to mind). 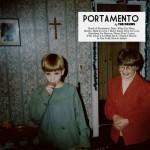 But as a grumpy exegesis on romantic, spiritual and personal disappointment, Portamento’s worth the dime and time for the bought-in: “What You Were” and “I Don’t Know How To Love” are brilliant, as good as anything on The Drums; “Money” is great hangdog inadequacy set to nervy C86-bounce, with layers of that smirking vocal stacking that drove the haters bananas last year. Although I’ll miss Psychic Chasms’s cosmic farts and bleeps and may forever wonder whether Alan Palomo might’ve done even more with the bonkers blueprint, he’s done the smart “career” thing, seizing on a little bit of notoriety (Fallon, blog love) to fashion a good old-fashioned synthpop band record (and a top 75 US album to boot). Props for a fully integrated sound as well; but for a couple guest turns, Palomo plays most everything you hear. When it works – “Polish Girl,” “Halogen (I Could Be A Shadow)” and the gorgeously downcast “Fallout” – it fulfills the promise of last year’s surprisingly refined OMD-meets-Yellow Magic Orchestra “Sleep Paralysist” standalone. When it doesn’t – the sandblasted stab at rock in “The Blindside Kiss” – it’s bad idea jeans. There’s still plenty of analogue squiggling built into his (now) classically pop-structured tunes, but if Palomo’s committed to this trad approach he may want to bump his vocs a little higher in the mix. The lyrics – on Era Extraña, reflecting a lonely work winter spent in Finland – aren’t throwaway and shouldn’t be buried. Extraña is very good – if not quite equal to Chasms – and represents an important developmental move into the indie big leagues. Long may Palomo bleep and bloop. Less immediately gratifying than previous records – and immediately disfigured by the abominably self-conscious opening tune – Strange Mercy doesn’t rewrite the rulebook so much as it rearranges the furniture: less emphasis on bewitching vocal stacks, more rope for strangled guitar textures, that sort of thing. The credits reveal some hired hands behind the Vincent facade – but it’s still the Annie Clark show, her placid singing style masking querulous lyrics, the harrumphing left to angular guitar bursts. The band lets loose once in a while – “Hysterical Strength” and “Cruel” get let off the leash for little runs – but the milky production does nothing for me at lower volumes, all smooth contouring, like IKEA office furniture designed by Apple. “Surgeon,” “Cheerleader” and “Champagne Year” are three good songs not too badly done in by the sound. But they’d be even better with a little blood on the teeth. I worry for the guy’s state of mind, but the fact is Girls is still batting a thousand after three releases in 24 months – sad records of regret and resignation – wherein the arrangements are moving further away from buzzing indie terra firma toward a kind of kitchen sink drama largely enabled by the studio duo of Chris Owens and Chet White’s increased instrumental and recording sophistication. “Vomit,” for instance, is a depressive stunner that turns its limited lyric into hypnotic gold by means of repetition and dynamic fortitude – at seven minutes it takes after Album’s “Hellhole Ratrace” – but never cracks its hair-trigger control, which makes the post-track silence at song’s end all the more chilling. “Forgiveness” is maybe even better: “Nothing’s gonna get any better if you don’t have a little hope, if you don’t have a little hope in your soul” is about as simplistic as Conan’s speech on cynicism on his final Tonight Show, and hits as true, especially coming after 30-odd minutes of woe betidings. Uncomfortably confessional yet encouragingly mulish. Father, Son, Holy Ghost isn’t easy to take – at least one play fell flat on its face when I just wasn’t in the mood – but barring a few forced, upbeat misfires, Owens is building an amazing, morose songbook.